Betterment Review 2019: Worth It (or Not)? Betterment is a robo-advisor, which means there's no direct human involvement in your investing. It uses algorithms to determine the best strategy based on your goals and risk tolerance. The platform only invests in Exchange Traded Funds (ETFs). ETFs are diversified collections of assets (like mutual funds) including stocks, commodities, and/or bonds. But unlike mutual funds, they are traded on an exchange, just like a stock. Betterment has NO minimum balance to start investing, which separates it from its competitors. But the platform has some drawbacks. Read our detailed review BEFORE you get started. Betterment charges an annual service fee to cover portfolio management and trading costs. The fee is split into four payments, which are deducted from your account based on the average daily balance each quarter. Downloading Betterment's app and starting your account is free. You'll also pay no fees for account deposits and withdrawals or buying/selling securities. The premium service adds unlimited access to financial experts. They can provide guidance on life events and investments outside of Betterment. Each tier offers a 0.10% discount for Betterment balances over $2 million (excluding 401(k) investments). Only the portion above $2 million gets the reduced fee. SPECIAL OFFER: Get up to 1 year free with Betterment. Learn more. Betterment uses two-factor authentication. You can use an authenticator app on the smartphone or SMS text to access your account. The platform is a member of the Securities Investor Protection Corporation (SIPC), which insures investments made through Betterment Securities up to $500,000 (per account type). That means if Betterment goes out of business, you will recover your funds. But Betterment or the SIPC does NOT protect you from losing money through investing. No, Betterment is not a bank and is not FDIC insured. Betterment accounts are SIPC-protected, which means that if they were to go out of business, SIPC would cover your losses (up to $500,000 per account type). It does not protect against investment losses from the market. You'll need to link a bank account to fund your Betterment. 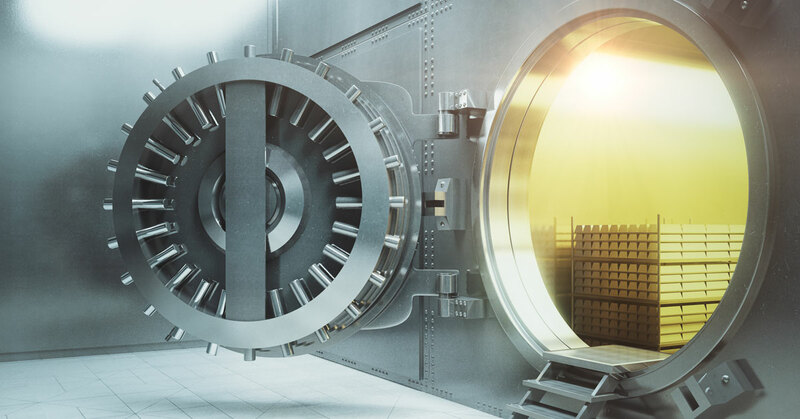 The money you deposit is transferred to Betterment Securities, a FINRA member broker-dealer. 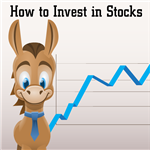 It buys ETFs according to the allocation of stocks and bonds in your portfolio. This happens automatically about 1 business day after - you don't have to do anything after depositing money in your account. Keep reading to see how to set your goals. You can set up multiple portfolios through the platform. For each, Betterment can automatically design the best strategy based on the goal and time horizon. If you are uncomfortable with risk, or if you may need your money soon and couldn't withstand a loss of capital, Betterment will select investments with less risk to your principal. If you can handle some risk, Betterment will select investments likely to show a lot of capital appreciation over time. Let's say you want to save $25,000 over the next five years for a house down payment. You would pick "major purchase." For this goal, Betterment selects an allocation of 48% stocks and 52% bonds. The platform estimates how much money you need to deposit each month to reach this goal. Betterment also provides a rough projection of the total amount in 5 years for both average and poor market performances. This portfolio is made up of globally diversified stock ETFs and bond ETFs. It is personalized for each individual person's goals and time horizons. If you have multiple goals, each one will have its own customized strategy. This portfolio only invests in bond ETFs. The goal is to generate income, without being concerned about growth or appreciation of principal. It's a great option for retirees looking for low-risk investments. Does Betterment offer good returns? The platform claims it would have outperformed the average investor with an advisor 88% of the time over the last decade. But it's important to remember that your returns will vary based on many factors, including the allocation. Betterment automatically invests money based on a portfolio that you adjust. This portfolio aims to provide better returns. It's more heavily invested in companies screened for value, high quality, strong momentum, and low volatility. Usually, Betterment decides your allocation for you. But the Flexible Portfolio allows you to modify your individual asset class weights to your preferences. Betterment will help assess the risk and diversification of your changes. This option is available to those with multiple accounts. It aims to increase your after-tax returns. Betterment will put your most highly-taxed assets into accounts with tax breaks (like IRAs). Assets with lower taxes will be diverted to the standard taxable account. How it works: Assets that pay dividends are taxed annually at a high rate. These will be placed into IRAs (which offer tax advantages). Other assets grow by increasing in value and are only taxed when you withdraw. These are better placed in taxable accounts. You must have at least 1 taxable account and 1 IRA account (traditional, Roth, or SEP) with Betterment in order to participate. The account invests in U.S. government bonds so it's low risk. It offers a guaranteed return based on current federal interest rates. Betterment's SRI portfolio contains stock from companies with positive environmental, social, and governance characteristics. NOTE: This portfolio is not 100% SRI. Betterment is working towards that by adding new SRI funds as they become available. Keep reading for a look at Betterment's other features. Betterment offers two ways to maximize your investments. When beginning a portfolio, you set your allocation (ex: 70% stocks and 30% bonds). This ratio will shift over time since stocks and bonds increase at different rates. Betterment automatically rebalances your portfolio every 3 months to ensure the allocation stays in line with your goals. 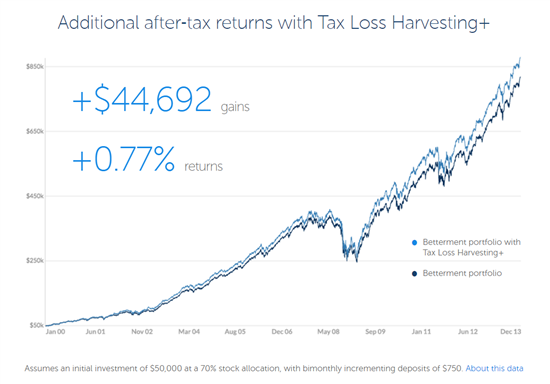 Betterment provides tax loss harvesting, a strategy that can reduce taxable income. This option aims to increase after-tax returns by offsetting capital gains to reduce your taxable income. If certain ETFs are experiencing losses, they'll be sold and replaced with similar securities (to maintain your portfolio allocation). This graph shows how Tax Loss Harvesting provided additional after-tax returns over a 13-year period. The Smart Saver is Betterment's solution to a high-yield savings account. 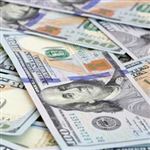 It invests your money in mostly low-risk U.S. government bonds and a small portion of low-volatility corporate bonds. Unlimited withdrawals (unlike the federal limit of 6 withdrawals/month for bank savings accounts). No penalties or fees for withdrawals. Can transfer balance between your Smart Saver account and linked bank account or taxable Betterment account whenever you want. Every Betterment customer can open one Smart Saver account. There is a fee of 0.25%. The yield rates are similar to high-yield online savings accounts. But Betterment invests your money in low-risk bonds, which may increase interest. Also, the majority of the interest you earn through the Smart Saver account isn't subject to state or local taxes. Betterment also analyzes your expenses and tells you how much extra cash you have sitting in your bank account. The two-way sweep feature automatically moves extra cash into Smart Saver. If your bank account balance gets low, it'll move money back in. That way, you won't be charged an overdraft fee. For $199, you get one 45-minute call with a licensed financial expert. This person will take you step-by-step through the process of setting up your Betterment account. You'll also receive a set of action items after the call designed to help you maximize your investments. This package also includes an action plan developed by Betterment's financial experts. Did You Know: You can also purchase Betterment's advice packages as gifts. Simply set a goal and transfer money to your account. Betterment selects investments and makes trades for you. Any profits are automatically re-invested according to your strategy. You can also take advantage of the platform's automatic rebalancing and tax harvesting to increase to stay on track and increase your overall earnings. Start investing with whatever funds you have on hand. This makes Betterment great for young or newbie investors without a lot of capital. Betterment's tax loss harvesting can reduce your taxable income and maximize your annual return. Betterment allows you to buy less than 1 full share of a stock. Every single dollar is invested, instead of just sitting in your account as cash. This feature automatically sends money to Betterment when your bank account exceeds a certain balance. You can set up the frequency and maximum transfer amount to maintain total control. Betterment's customer service is available 7 days a week by phone and email. Betterment only invests in ETFs. For beginners and those with simple goals, this is probably plenty. But for those with more complex investing needs, Betterment 's offerings may be too narrow. In other words, if you're expecting Betterment to work like an E*TRADE account, you may be disappointed. If you have significant money to invest, the annual flat rate fee for the Premium Account can be a little steep - $100,000 in investments will cost $400 in fees at the 0.40% tier. With a large amount of money to primarily buy and hold, you're probably better served by a broker with a per transaction fee. If you understand investment strategy, you could make more in profits by selecting investments yourself. Wealthfront and Betterment have a lot of similarities. Pay close attention to fees, as both services have changed their fee structures in the past year. These fees differ depending on how much you have to invest. 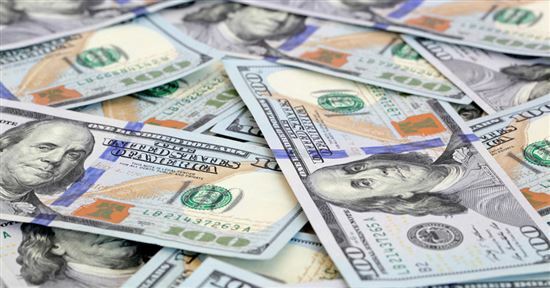 If you have a lot to invest, Wealthfront has a few advanced features that Betterment lacks. 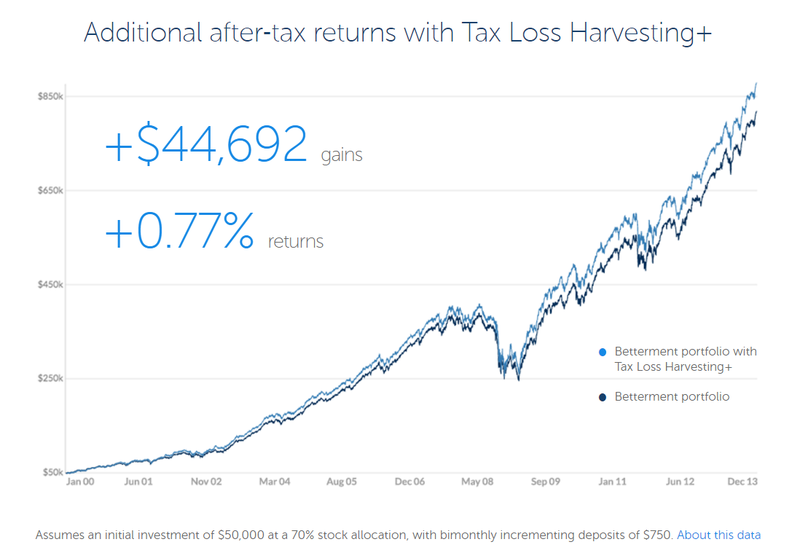 Wealthfront can also create more complex investment structures and can do a better job at avoiding taxes. Vanguard is a huge investment management company. Vanguard offers a Personal Advisor service, which gives you an actual person managing your account. That person will select your investments based on your goals and financial situation. Vanguard requires a minimum investment of $50,000 for this service. And it charges a flat 0.30% annual fee. Just like robo-advisors, Vanguard will do the work for you, including rebalancing the portfolio. Clients can contact the advisor whenever they like. For a low 0.30% flat fee, this is a great service if you have more to invest and want human interaction. Acorns uses an "invest spare change" approach. You link a bank account and credit cards to your Acorns account. After every purchase, Acorns will round up the spare change and automatically invest it for you. This is a good way to invest without thinking. But you can't build real wealth from spare change. Betterment is better for those serious about retirement savings. And Acorns' monthly fee may be high if you keep a very small balance. Robinhood offers $0 stock trades by cutting out physical offices and manual account management. Only basic stock trading can be performed on the mobile app. There is no minimum deposit or maintenance fee, though there is an optional paid premier customer tier starting at $6/month. Personal Capital offers free advanced financial tools and paid wealth management services. Stash simplifies investing for novices. This app is not a robo-advisor and will not manage investments for you. Instead, it guides beginners to select investments aligned with their goals and risk level. There is no minimum balance, but you need $5 to start investing. The fee starts at $1/month for accounts less than $5,000. 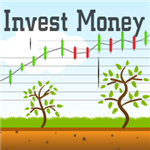 M1 Finance offers free automated investing with no commissions or account fees. Unlike other robo-advisors, M1 lets you select your own investments and their automation will manage it for you. This is great for investors who want a say. The downside is that there are no human advisors. The minimum to start is just $100. Charles Schwab Intelligent Portfolio charges no service fees, rebalance fees, or commissions. It offers highly diversified portfolios, consisting of up to 20 asset classes in any portfolio. The minimum investment is $5,000 to start. This robo-advisor has over 300 physical branches if you need in-person help. Get $10,000 managed for free for one year when you invest with Wealthsimple for the first time. Is Betterment a good investing tool? Betterment is ideal for beginners who aren't ready to invest on their own AND for investors who prefer to be hands-off. The service fee is low, so you get to keep more of your profits. But like all investments, returns are not guaranteed. Can you withdraw money with Betterment? Yes, you can withdraw funds back into your bank account at any time with no penalties or withdrawal fees. However, if you withdraw funds from an IRA account before age 59-1/2, there will be a tax penalty. Note: Withdrawals generally take 4-5 days to complete. 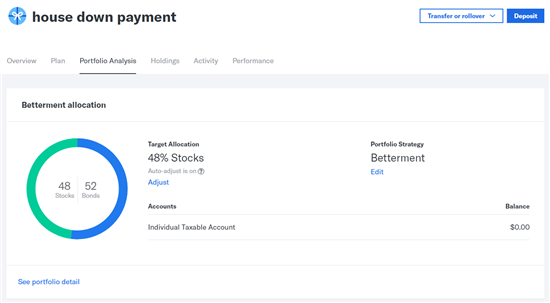 Can you buy individual stocks on Betterment? No. Betterment is a robo-advisor that automatically invests in a diversified portfolio of ETFs. You cannot trade individual stocks or funds on your own. And you do not make your own investing decisions. Betterment has no account minimum and a low fee structure for those with little money to invest. If you have a lot of capital or if you want more control over the process, another brokerage service might be better. For those just starting out and uncomfortable with choosing their own investments, Betterment makes a lot of sense. There's no guarantee your investment will grow, but we like your odds. And you can't start growing a nest egg without a little bit of risk. Leave a comment about Betterment Review: Pros and Cons?